Along with toasting bread, toaster ovens can bake and broil. If you use yours to bake a potato, you can free up your conventional oven for other dishes. 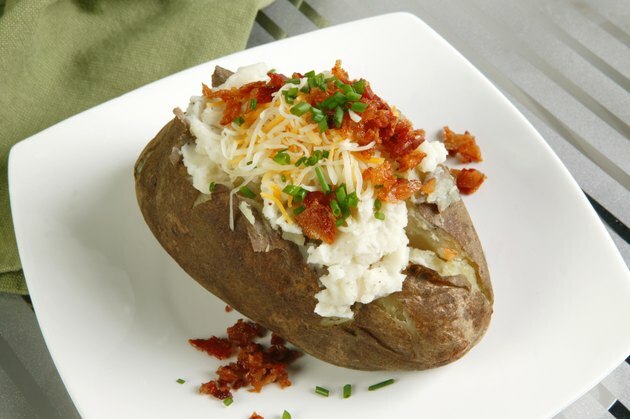 Baked potatoes make a satisfying side dish or main course, especially when topped with lean ground beef or reduced-fat cheese. It generally takes about an hour to bake a potato in a toaster oven, depending on the size of the potato. Wrapping it in foil before baking actually steams the potato, trapping in its natural moisture. Preheat your toaster oven to 425 degrees Fahrenheit. Choose potatoes that are firm and that do not contain any blemishes or green spots. Rinse the potato under cool running water. Scrub the skin to remove any dirt; most of the nutrients in a potato are contained in the skin. Poke several holes into the top of the potato with a fork. The holes allow the steam to evaporate and will help to prevent the potato from exploding while cooking. Rub olive oil around the outside of the potato for flavor. Wrap the potato in aluminum foil and place it on the toaster oven baking tray. Cook for 45 to 60 minutes or until the potato is tender throughout. You can insert a fork into the center of the potato to determine if it's ready. Allow the potato to sit for five minutes after cooking. Serve while warm. You can bake multiple potatoes at the same time in a toaster oven, depending on the size of the oven. Add 10 to 15 minutes cooking time when baking four or more potatoes together.